The weather has turned in my part of the world and my thoughts have turned to food that warms the body and the soul. 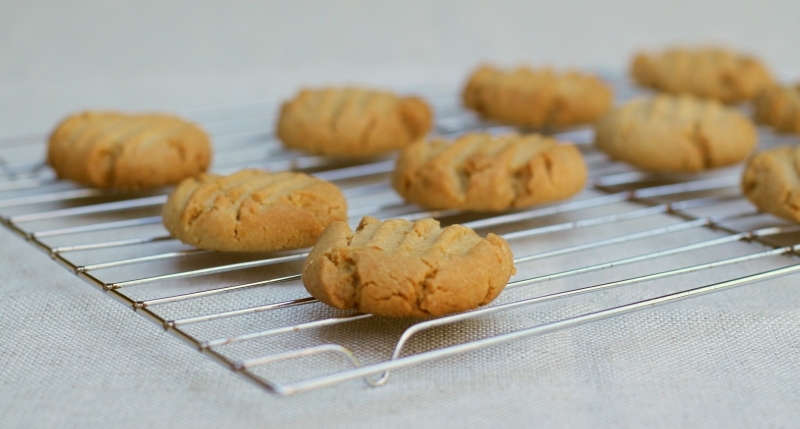 These peanut butter biscuits are quite plain in their appearance and are made with simple ingredients that would be in many people’s pantries. 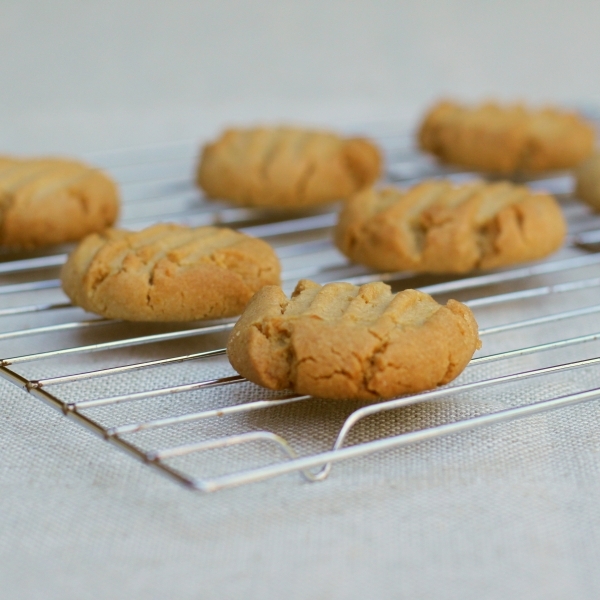 My recipe is based on one from a Women’s weekly biscuit cookbook that I tweaked for my taste. This cookbook was a staple for my generation – most of my friends had a copy, and all were well used! This recipe is also so low tech and easy that you don’t even need electric beaters, just a wooden spoon for mixing. The biscuits are nutty and tender, and just the thing with a cup of hot chocolate on an autumn afternoon. I used to make them for school lunches, but alas, there are so many kids with nut allergies nowadays, we save these for home. Preheat oven to 160 C. In a medium sized bowl beat together the butter, lemon rind, sugars salt and peanut butter, using a wooden spoon. Add the flour and bicarbonate of soda and mix together to form a fairly stiff dough. Roll spoonfuls of the mixture into walnut sized balls and place onto a baking tray that you have lined with silicon paper. Press down and flatten the balls with the tines of a fork. Place in the oven and cook for 10 – 15 minutes until lightly golden. Remove from the oven and when they have cooled a little, place on a rack until cold. Store in an airtight container. These biscuits will keep for around 5 days. Like the idea of extra nuts. I’m glad to hear of another cook who knows that Beautiful Biscuits recipe book. It looks quite dated now but there are heaps of really good, basic biscuit recipes in it. I don’t think I’ll ever part with mine..too many good memories. Feel the same way about the Children’s Birthday Cake book. Even though my kids are way beyond novelty cakes, they still enjoy looking through that recipe book remembering the cakes of their childhood. I make this WW recipe too. Sometimes I add 1/2 cup crushed peanuts for extra crunch, other times 1/2 cup choc bits. It’s winner every which way.